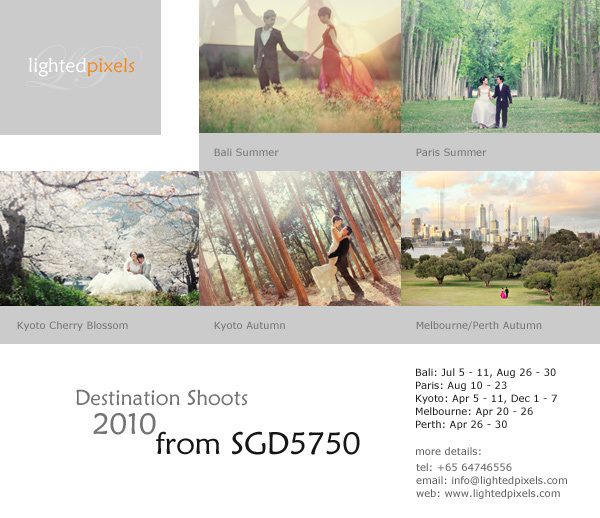 Lightedpixels Destination Shoots for 2010! Phew! Our list of destinations for 2010 is finally done up and we have confirmed bookings for the following trips in 2010! Kelvin and Alwin will be there shooting. Please inquire if interested! If there are any other locations that are dear to you and you would love to have a shoot there, do email us to enquire about a customised package! Email us at info@lightedpixels.com or call us at 64746556. ~ by wangxiaoting on January 21, 2010.